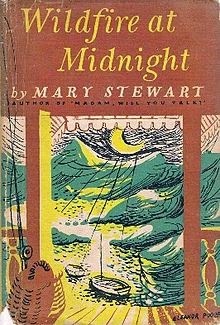 First published in 1956 Wildfire at Midnight was Mary Stewart's second novel and one in which she attempted to create something different - a classic closed room detective story. It was an experiment she would not repeat explaining in a 1970 article that the emphasis on mystery was not for her - she preferred people to plot. In the years to come her books would become known and loved for their perfect balance of romance and mystery set in exotic locations and with that in mind I wouldn't recommend Wildfire at Midnight to anyone just beginning their acquaintance with Mary Stewart. It is high on suspense and low on romance which suited me fine as I love the former and am happy to go without the latter. An added bonus was discovering I hadn't read it before. 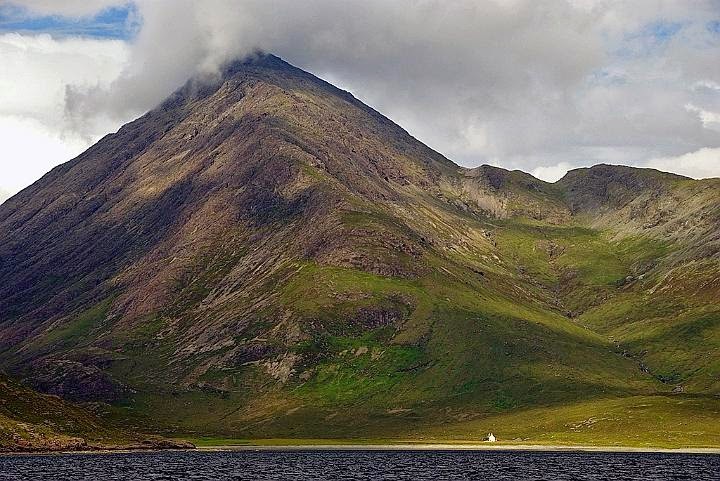 In need of a holiday from her busy life as a model and tired of the crowds pouring into London for the coronation of Queen Elizabeth, Gianetta sets out for a quiet interlude on the Isle of Skye. To her horror one of the guests at the hotel is her ex-husband, Nicholas. Even worse is the strange tension existing among the other guests. Very soon she discovers that recently the body of a local girl had been found murdered on the mountainside and all her fellow residents are considered as suspects. Then two more murders occur and a young woman is missing. A killer is on the loose and suggestions of ancient Druidic rituals and sacrifice only add to the escalating fear and suspicions of everyone. Mary Stewart's choice of setting for this novel is superb. Usually her descriptions of lavender fields and sunflowers, red-roofed tavernas and sun-kissed seas have me sighing with longing to visit these magical places. I have no desire to go to the Isle of Skye. An island of rugged but barren grandeur, with treacherous bogs and blinding mists holds little appeal for me but is used to full effect by the author to create a real sense of atmosphere and foreboding. There the crest of the mountain stands up above the scree in an enormous hog's-back of serrated peaks, two thousand feet and more of grim and naked rock, shouldering up the scudding sky. I stopped and looked up. Streams of windtorn mist raced and broke around the buttresses of the dreadful rock; against its sheer precipices the driven clouds wrecked themselves in swirls of smoke; and black and terrible, above the movement of the storm, behind the racing riot of black cloud, loomed and vanished and loomed again the great devil's pinnacles that broke the sky and split the winds into streaming rack. 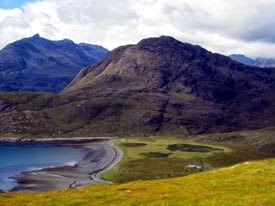 Blaven flew its storms like a banner." Gianetta finds herself in terrible danger which reaches its peak in a terrifying chase through the mist enshrouded bog. The suspense was edge-of-the-chair, nailbiting stuff that kept me frantically turning pages until the end and I thoroughly enjoyed it. From excessive cigarette smoking to outdated attitudes that rile up the feminists, Wildfire at Midnight does show its age which I know many readers don't like but for me it is all part of the charm and the pleasure of returning to a different time. 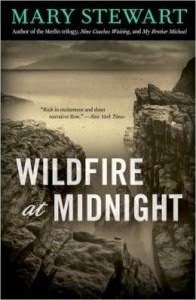 I read Wildfire at Midnight as part of Mary Stewart Reading Week hosted by Anbolyn @ Gudrun's Tights.